The DAX is a blue-chip stock market index which comprises of thirty major German companies trading on the Frankfurt Stock Exchange (FSE). In this sense it is similar to the Dow Jones Industrial Average which also shows how 30 large publicly owned companies in the US have traded. Some of the leading companies in the DAX index are Siemens, Allianz, Adidas, Deutsche Bank, ThyssenKrupp and Lufthansa. Germany is the largest economy in the European Union and in the top 7 largest economies in the world. The DAX is a capitalization-weighted index which means that the companies with a greater market capitalization will have the greatest influence on the price. The DAX actually started it's like known as the Börsen-Zeitung and it was started by a German financial newspaper. If you had bought and held the DAX from the 1960's you would be in a very healthy profit now. 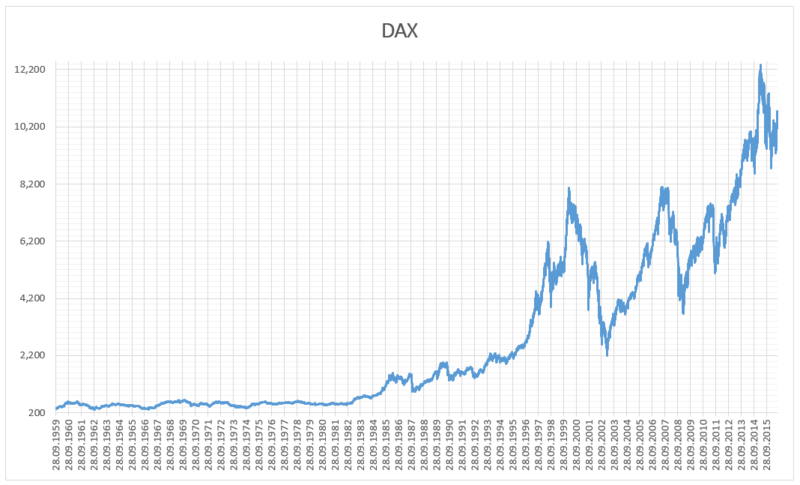 The DAX has made strong growth since its inception and it went through 2000 points in 1993, 5000 points in 1998 and during the financial crisis of 2008 the DAX had made it above 7500. The Dax reached its record high this year peaking at 13,596.89 in January. Its current price is 12,346 and the chart below shows how it's value has increased since 1959 when it was priced at only around 300. The exchange for DAX futures is the Eurex which has a market opening time from 0700-2100 BST time. Trading the DAX can be done day to day as there are many moves to be had. Trading the DAX with SimpleFX is very easy. Here are some top tips for trading the DAX. At the moment there is a crisis going on with the Turkish Lira. The reason this affects the DAX is because the nation of Turkey runs on a currency account deficit the worry is that they will end up defaulting on the loans that European banks have made to Turkey. As a consequence, the DAX has been being sold off on the fear of contagion from Turkey extending into Europe. On top of this crisis the US China Trade war has been weighing on global sentiment and the DAX has felt the weight of that recently too. So, since the start of August the DAX was sold off and tested recent daily support levels at 12200. It is now looking at testing that level once again with the Turkish situation far from resolved (the Lira is still really weak) and the US China trade war shows a risk of heating up with Trump wanting to announce a further $200 billion in tariffs. Arguably the most widely followed aspect of technical analysis is support and resistant levels. Support and resistance levels are key market levels where price has shown reaction in the past. As price moves towards those levels, which price has reacted at previously, they become significant as points in the market dividing buyers and sellers. For example, price is now approaching the key daily support level on the DAX which is a previous double bottom at 12200. If risk sentiment returns into the market, the US China trade war recedes, and the Turkish Lira crisis is controlled the DAX will likely rally on the fundamental shift. Traders could place their stops on the other side of the support level in the 12000 region for a play back to the 12900 region. Some of the most popular moving averages are the 50, 100, and 200 moving averages. These moving averages show what the average price has been over the last 50, 100, or 200 periods. 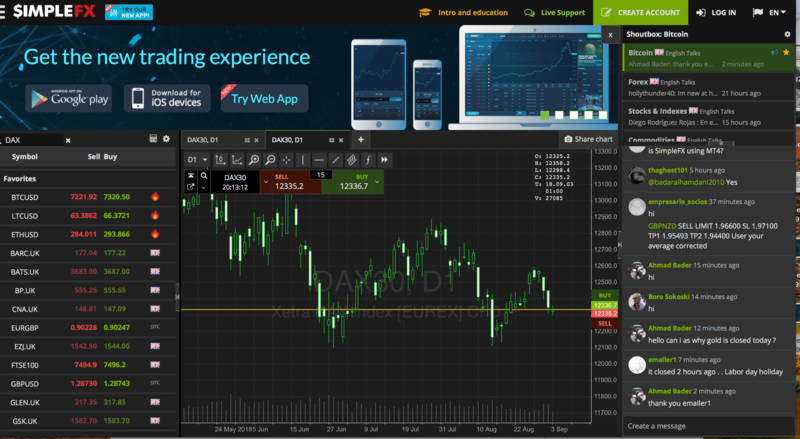 These can be very useful in providing good places to enter the market especially as they are widely respected technical tools that are viewed by many traders. It is preferred to use the exponential moving average as it is more responsive than the simple moving average. If you look at the chart below you can see how price respected the 100 MA level on the 1-hour chart on the DAX. Knowing the DAX was fundamentally weak would have given traders confidence to lean on the 100MA as a key place to define and limit risk. The Fibonacci tool was named after a 13th Century Italian mathematician, Leonardo of Pisa, known as Fibonacci. He was the son of a Pisan merchant and he traveled widely and traded frequently. Fibonacci numbers are found extensively throughout the natural world and they are also used in trading as one of the most common trading tools. By using these common technical analysis tools, traders are well equipped to identify places to enter, exit and place their stops. 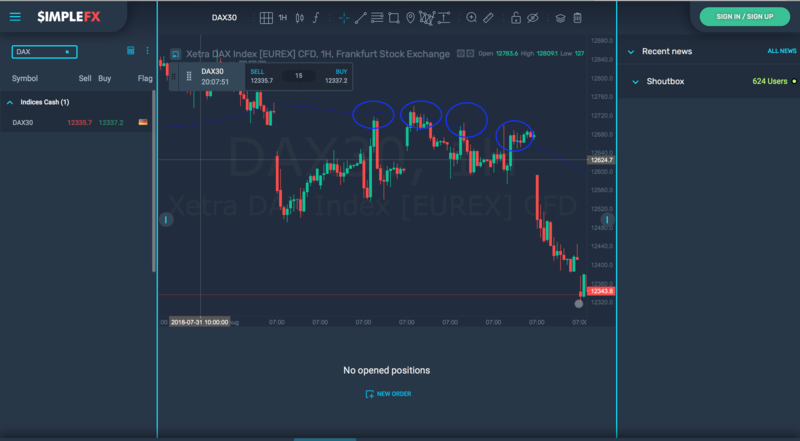 Technical analysis should not be used in isolation from sentimental and fundamental analysis when trading the DAX, but when used in combination with them it becomes a powerful component in successful trading.